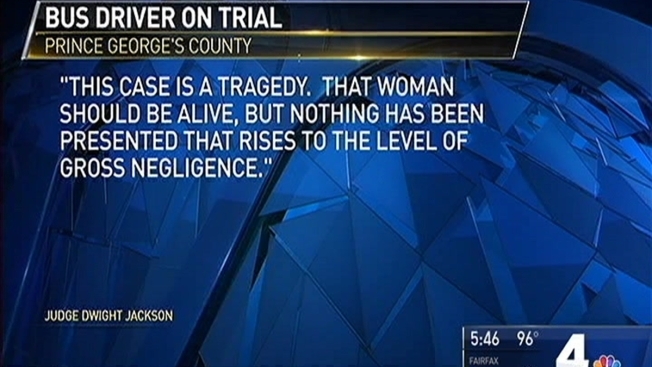 A former Prince George's County transit bus driver on trial for striking and killing a woman is now only facing traffic charges. A judge dropped the manslaughter and criminal negligent homicide charges against Michelle Murray Thursday. Patsy Stokes Burton was crossing the street when Murray struck her in Upper Marlboro in 2014. Burton, 69, died at the scene. Surveillance video showed Burton legally crossing the street at the time of the accident. The judge called the case a tragedy, but said there's a "thin line between prosecution and persecution." Murray is now only facing traffic charges in connection with the accident. "She’s very grateful to the court system, to Judge Jackson who is a former prosecutor, for finding that there was no basis for these manslaughter charges to go forward," said Kimberly Righter, Murray's attorney. Burton's widower, Mack Burton, said he is at peace with the judge's decision to throw out all criminal charges. "I’m satisfied because when I came to court I left in the hands of the judge and the jury," Burton said. "The judge made a decision and I’m satisfied and as far as I’m concerned it’s over with." Burton said he spoke privately with Murray and told her he doesn't hold any bitterness toward her. "It was very emotional and she had tears running down her eyes and I believe she really is sincere and believe she really meant what she said. So, I took my handkerchief out and wiped her tears away," Burton said.